Nike has already provided five of the brand's big clubs' third shirts. And now the American giant introduces three more: Meet the Chelsea, Manchester City and Tottenham third kits. We've already seen it on the Paris Saint-Germain, Inter Milan, AS Roma, Atletico Madrid and FC Barcelona shirts. The Nike camouflage design is all over the Swoosh's third kits, and the dazzling template also dominates Nike's three big English clubs' third shirts which will mainly be used in the Champions League. 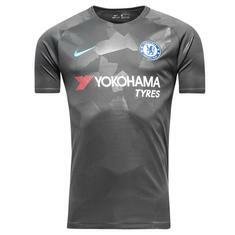 The Chelsea 2017/18 third kit introduces the geometrical camouflage design in a anthracite main colour that is combined with with white and bright blue details, specifically the Swoosh on the right chest and a thin stripe on each sleeve. The new Chelsea kit might actually be the neatest of all the Nike third shirts, as the shirt is very subtle and yet still bold with the camo design. Gonna be awesome to see Eden Hazard rock this one. Do you support the Blues? Get your Chelsea kit right here. 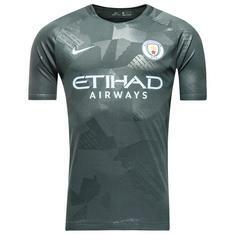 A candidate to the most fresh Nike third kit is the Manchester City 2017/18 third shirt, also based on the camouflage template. The kit introduces an interesting new colour combination for the Citizens, combining dark green with the club's traditional sky blue. The main colour is 'Outdoor Green', and this base is paired with 'Field Blue' accents for a touch of City's legacy. A winning colour combination that provides the shirt with a gorgeous look. Who wouldn't play in this? If you're a Manchester City fan, you can get your Citizen shirt here. We started in London, and the English capital is also where we find the last Nike third kit. 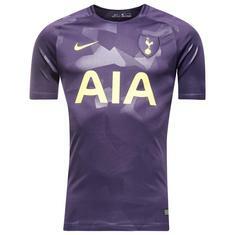 The Tottenham 2017/18 third shirt features a dark purple base with 'Volt' details, which applies to the club logo, once again appearing inside a shield, Nike and sponsor logo as well as thin stripe that runs down each sleeve. Being a fan of the Nike third kits' design this year, I don't really know how I feel about the Spurs' colour combination. It's definitely a bold and different choice than the club's home and away shirts, but maybe it just needs some getting used to. Don't you agree? Support Kane and co. this season, and get your Spurs kit right here.